Pure Play Storage vendors of 2017/2018? 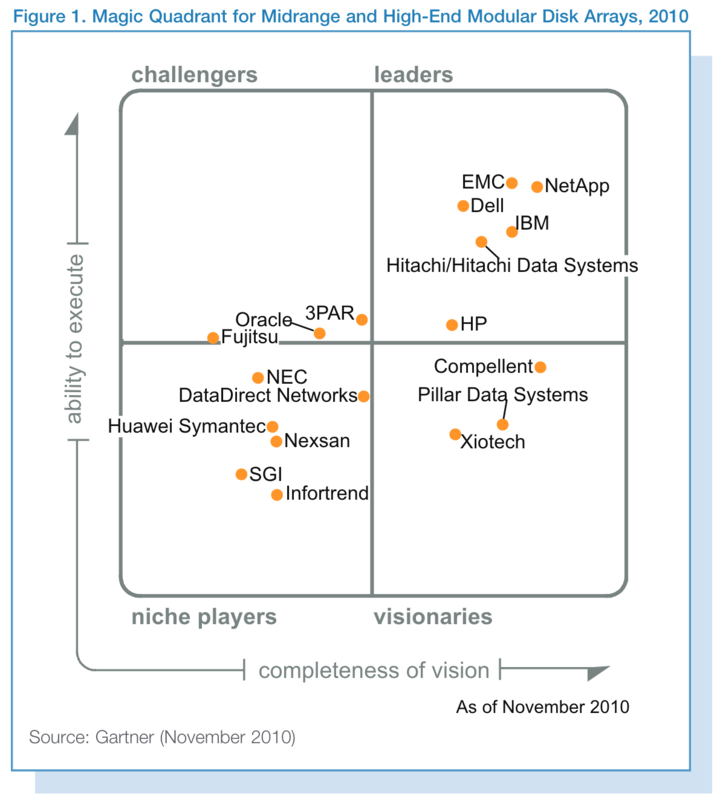 NetApp is the only vendor left in the Leaders quadrant. 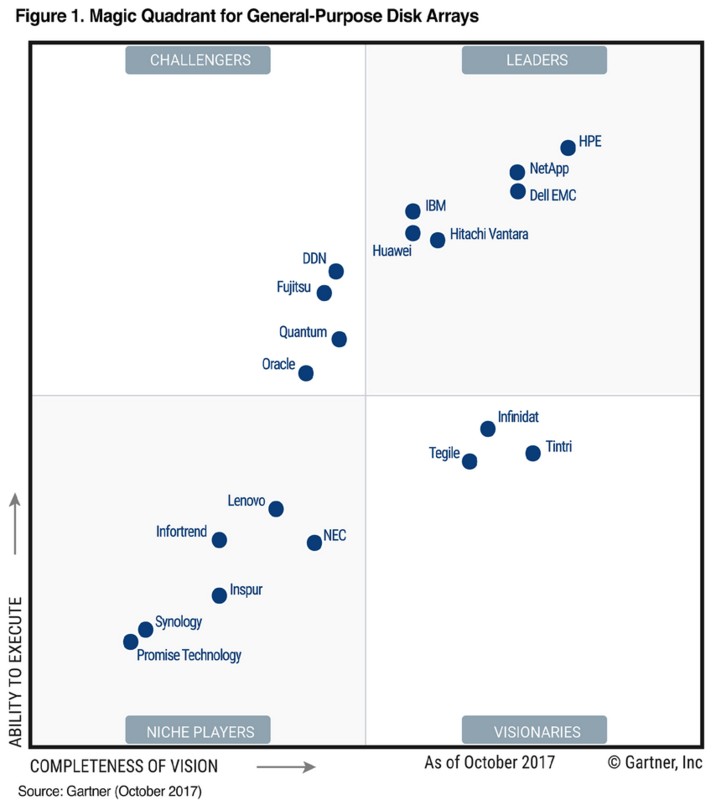 Infinidat is in the Visionaries quadrant; Tintri and Tegile are gone whilst DDN and Quantum are in the Challengers quadrant. The Taiwanese trio of Infortrend, Synology and Promise Technology complete the whole landscape. Are Pure Play Storage Vendors losing their shine? Given the time of the past 8 to 9 years, Pure Play storage players seem to have lost their shine in this whole new world. Their relevance has been usurped by the Digital Transformation and Data Center Modernization stories that have been ramping up unabashedly and unsurreptitiously, with more to come. And we might come to the conclusion that Pure Play storage vendors should just forget about being pure play, abandon their DNA and join the bandwagon and be like Dell Technologies. This Computer Weekly article a few days ago was the trigger point that got me thinking about Pure Play storage vendors. Are they still relevant and progressive given the onslaughts of the Cloud Service Providers, Hyperconvergence, Composable Infrastructure, Edge Computing, IoT, AI, Machine Learning, Blockchain and many more? NetApp remains the only bright light in this darkness. They are the only Pure Play storage vendor left of the Big 5, and they are thriving well. But if you recall events of 5-7 years ago, NetApp was late in the All-Flash arena and has no answer to the HCI (hyperconverged infrastructure) attacks. Their stock price was not performing and they seemed to have lost their mojo. They were on the path to irrelevance. Then they replaced their CEO, introduced Data Fabric, bought Solidfire and made some smart partnerships. Their 2 recent partnerships with Microsoft for Azure NetApp Files and with Lenovo brought good vibes to their market, and their Cloud Volumes innovation is driving new businesses with cloud players of AWS, Azure and Google Cloud. And the NTAP stock has been flying high for the past 12 months. NetApp remained Pure Play despite of it all. What a turnaround! The NetApp story is proof that Pure Play storage is good. But what are the right ingredients for a Pure Play storage vendor like NetApp to be successful? I don’t know the answer, but I am pretty sure the strongest ingredient is their Culture. I have always referred to NetApp as “The Little Engine that Could” and they have been headstrong throughout their 26 years of existence to be independent, innovative and most of all, Values. 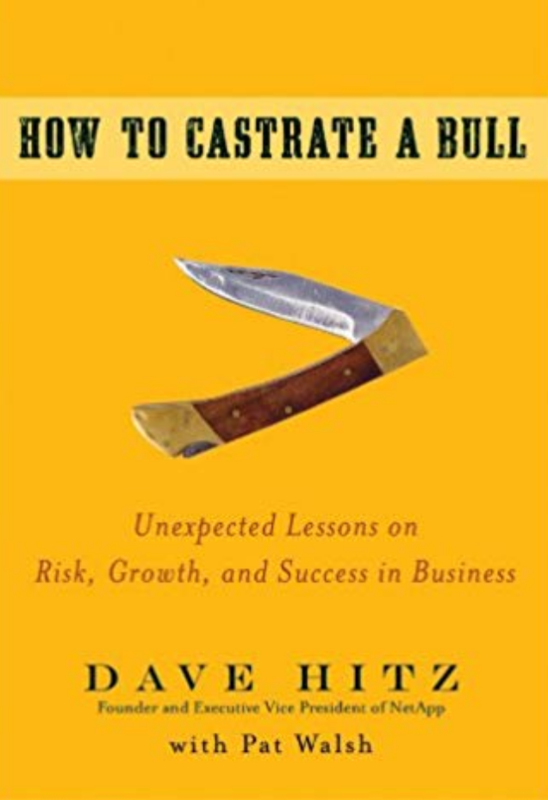 Perhaps that Dave Hitz attitude of “How to Castrate a Bull” has something to do with NetApp’s culture as well. Pure Play storage vendors can be successful as NetApp has proven. Pure Storage is also a Pure Play, and they have started well and thriving. They have the focus, with a strong culture of innovation. Just look at their AIRI (Artificial Intelligence Ready Infrastructure). They also have proven that Pure Play sets the technology innovation bar much higher to disrupt the market, to change the rule, and define the game. My excursions to Storage Field Days in the past 2 years also have its fair share of good and worthy Pure Play storage vendors. Recent ones include Hammerspace, Drivescale, Datrium, Hedvig, E8 Storage, Weka.IO, Excelero Datera and a few more. In conclusion, Pure Play storage vendors will continue to have the fertile ground to drive new and exciting innovation in the storage technology industry. The technology envelope will be pushed further and further, and when one door closes, a new one opens. Never mind that they might not appear on the Gartner Magic Quadrant any time soon. The Pure Play storage vendors will continue to dot the landscape and hit the marketplace with more technology advancement in the years to come. Your comments are welcome. I look forward to active banter on the topic. NOTE: Just as I published my blog today, the latest 2018 Gartner Magic quadrant was released as well. Here is The Register’s article on the report. Tagged data center modernization, digital transformation, Gartner Magic Quadrant, pure play storage, storage arrays, storage innovation, technology culture. Bookmark the permalink. One Response to Is Pure Play Storage good?